Another thing checked off my checklist: cook mussels! You’re probably looking at this dish and thinking, “wow – that looks labor intensive,” but I swear, it isn’t! 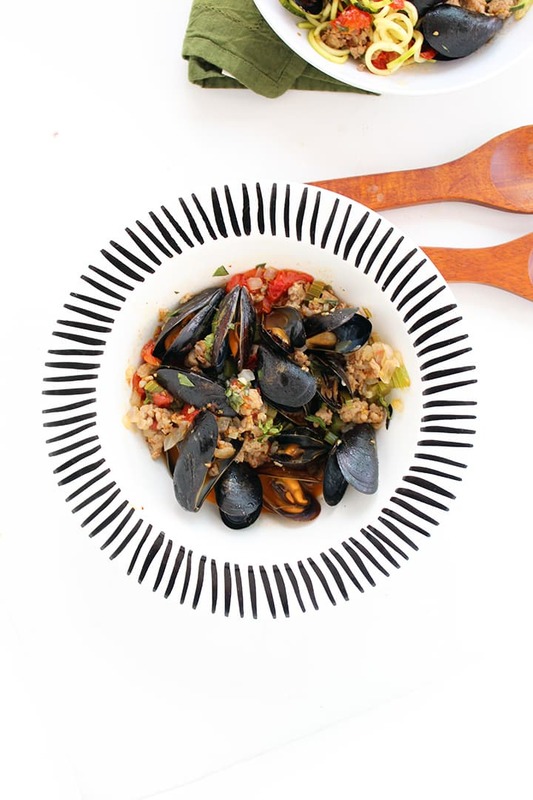 I whipped this dish up so quickly, I barely had time to find a pretty bowl to plate it – I almost overcooked the mussels, because I didn’t think they’d be done so quickly. I ordered some mussels from Fresh Direct, with a Plan B – if they were too overwhelming, I’d just use shrimp instead for the recipe I had in mind. 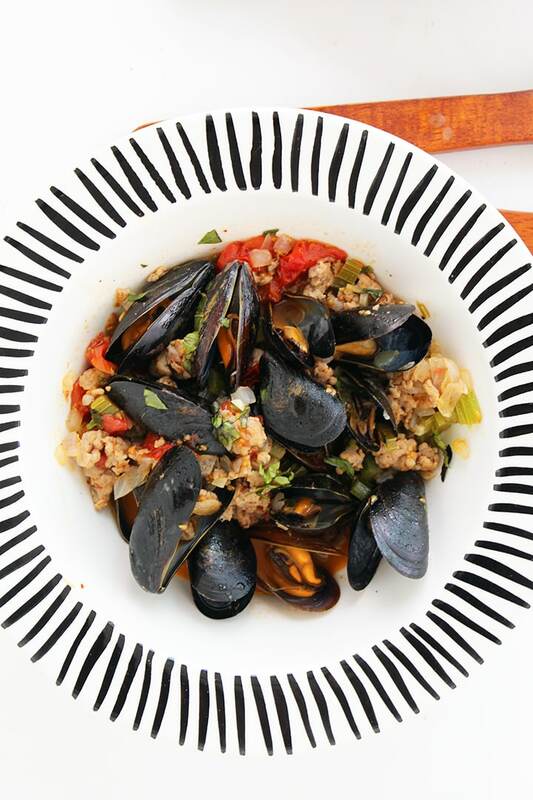 I opened up the package of mussels, Googled “how to prep mussels” and found this handy article on how to clean and “debeard” (yes, debeard) mussels by The Kitchn. After reading that, I went over to the mussels, scrubbed them with a clean sponge, debearded them (just pull out the clump of “hair” on the corners) and set them aside. Then, I began cooking the rest of my recipe, which was pretty standard – onions, garlic, tomatoes, sausage, basil. Once the sausage mixture is done cooking, I added in the mussels, covered and then two minutes later, checked and they were all opened, like magic! 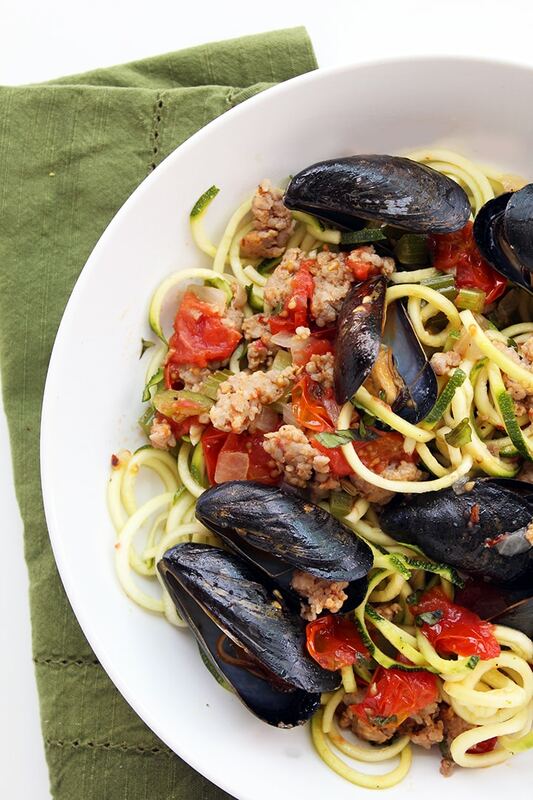 I literally had to scramble to pull the rest of the recipe together in time to plate the mussels and sausage with the zucchini noodles. After a quick taste and a quick “mmmm!”, I ran over to the window where my coffee table is that I use for taking photos, placed down a linen napkin and the bowls with the food and snapped some quick pictures. Now, here we are. 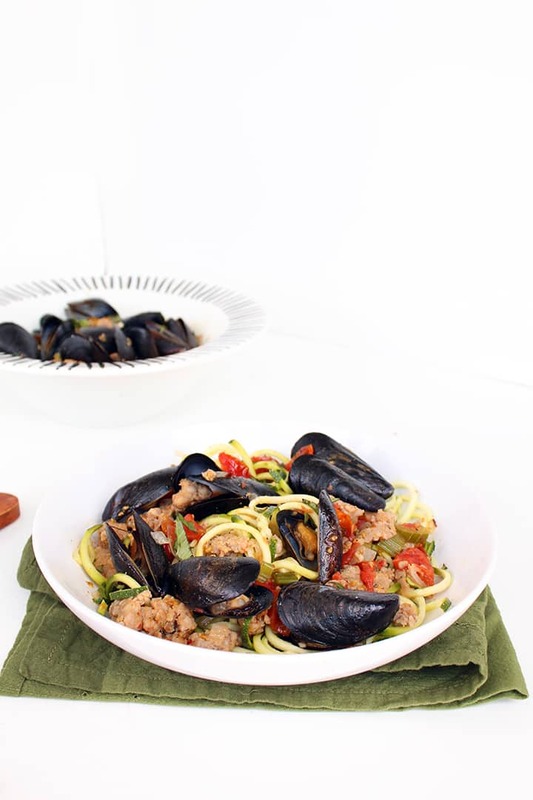 This dish is incredibly rich and flavorful, without those heavy carbs and calories that come with using regular pasta or using butter with the mussels. 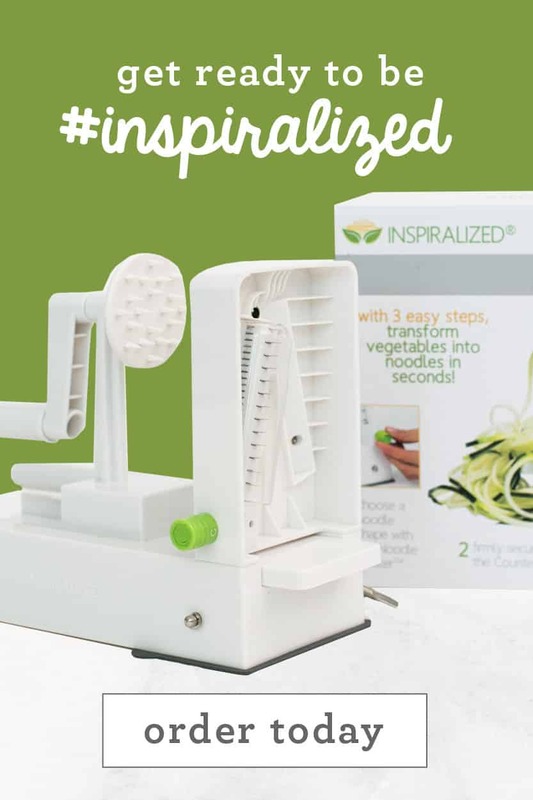 I was actually shocked by the nutritional information – again, the spiralizer shows us that healthy eating doesn’t have to be restrictive: you can literally have a big bowl of mussels, sausage and pasta without breaking your diet! The basil really seals the deal – the hints of garlic, warm bursted tomatoes and sweet sausage is just pure summer lovin’. It’s important to use an Italian sausage that has fennel seeds in it (most Italian sausages do) and if you can’t find one like that, add in a half teaspoon of fennel seeds to the dish, along with the garlic. Tonight (well, it’s Tuesday as I’m writing this) I need to figure out what to make for dinner, since Lu’s mom, his brother and his sister-in-law are coming over for dinner. Sounds like I may just have the perfect dish…. How do you like your mussels? 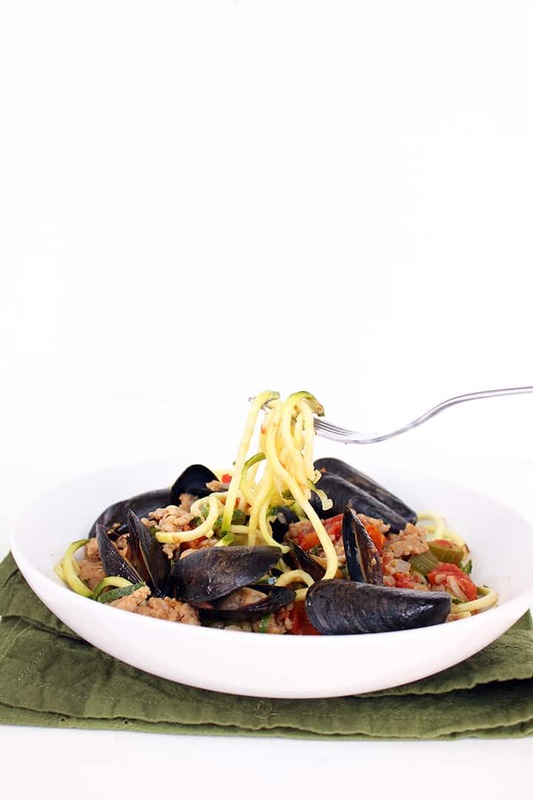 Scrub each mussel individually, trying to remove as many of the stringy pieces that cling to the outside as possible. Then, look at the crack where the two shells meet on the mussel and pinch the strands that look like threads of brown seaweed, tugging to remove. 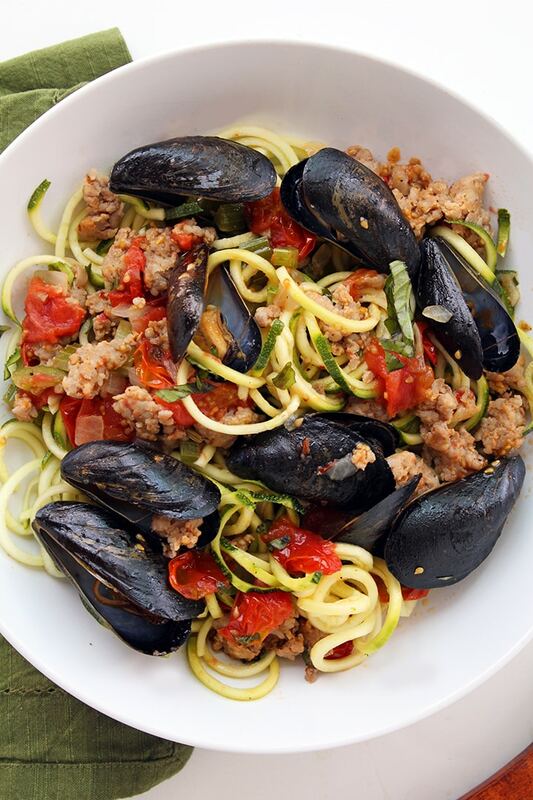 Repeat with all mussels and set aside. Heat the olive oil over medium heat in a large non-stick skillet. Once oil heats, crumble in the sausage and cook until browned, about 5 minutes. Then, add in the celery, onion, red pepper flakes and garlic and cook until vegetables soften, 3-5 minutes. Raise the heat to medium-high and add in the tomatoes, season with salt and pepper and cover, cooking another 5 minutes. Lower the heat and add in the basil and mussels. Cover the pan again and cook until the mussels open, about 2 minutes. Discard any that do not open. 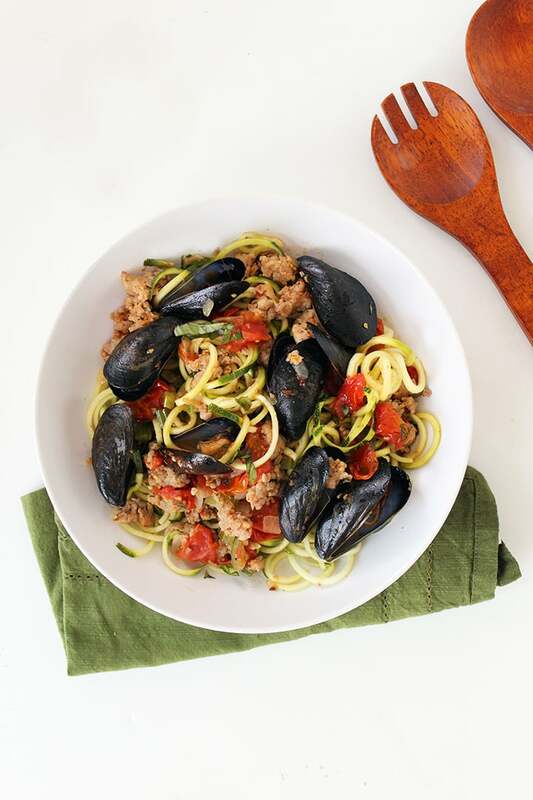 Add the zucchini noodles into a large serving bowl and then pour over the mussel mixture and toss to combine. As the sauce sits over the noodles, it will soften them. Let sit for 2 minutes for the flavors to absorb and then serve. 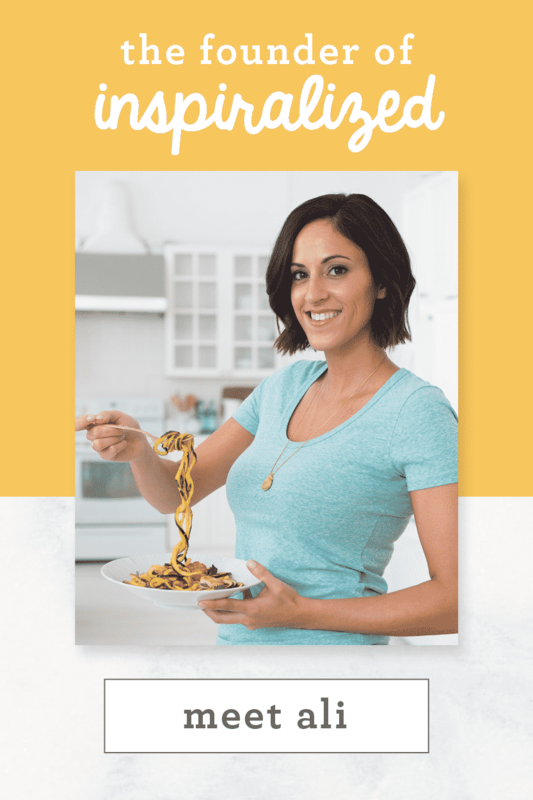 Hi Ali, This looks absolutely delish! You made mention of adding fennel, do you suggest crushing it? Last night I picked my first couple of zukes and made a scallop and sugar snap pasta dish with a honey mustard sauce. 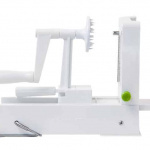 My first attempt using the spiralizer and am quite pleased with how it turned out. 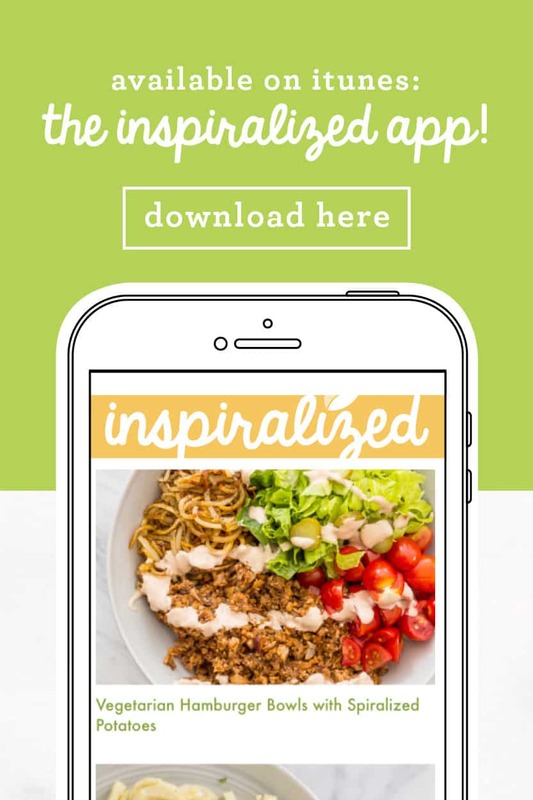 Thanks for sharing all your wonderful spiralized dishes! 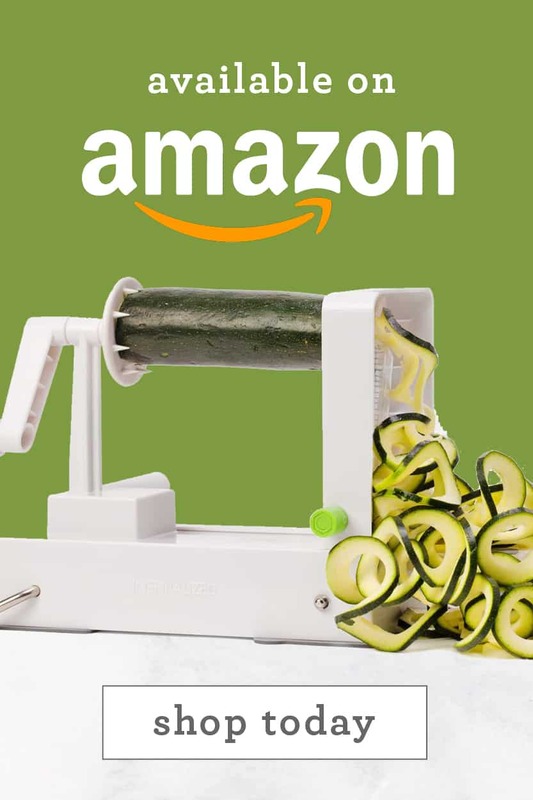 No need to crush it! Was waiting for this recipe since I saw it on Instagram yesterday. 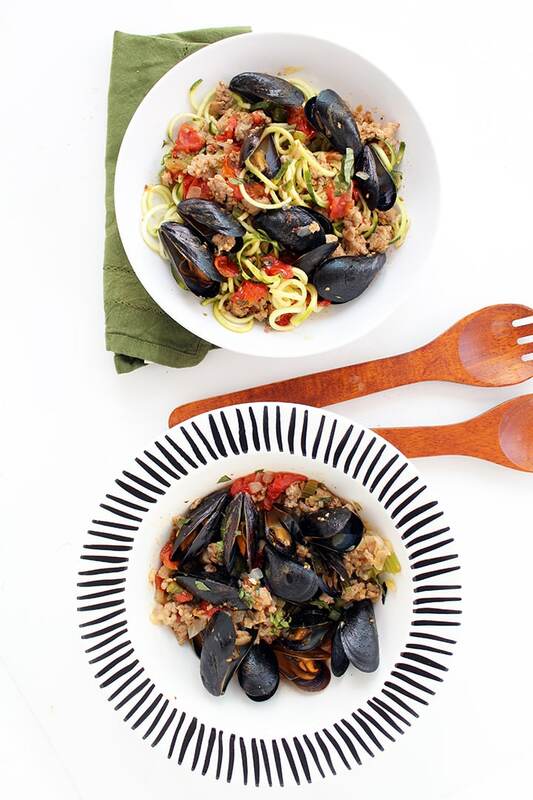 I love mussels and am excited to give this recipe a whirl! 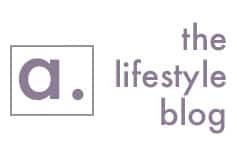 Thanks for your "Inspirilation"!! Let me know how it comes out, Jean! A trick I learned while living in New England for a number of years.....After cleaning and de-bearding the mussels.....put them in water and sprinkle corn meal on top of the water. You will see bubbles as the mussels eat the cornmeal.....it makes them taste really sweet. If you are cooking clams, which tend to be gritty....sprinkle red pepper on the water. It makes them "sneeze" out the grit. Diane, thanks for the tips! I had heard of the red pepper one but not the cornmeal. Mmmm....this recipe looks delicious!! I grew up on the west coast and although I've eaten some very good mussels in restaurants, I've never cooked them myself. You make it sound so easy that I can't wait to try this one!! 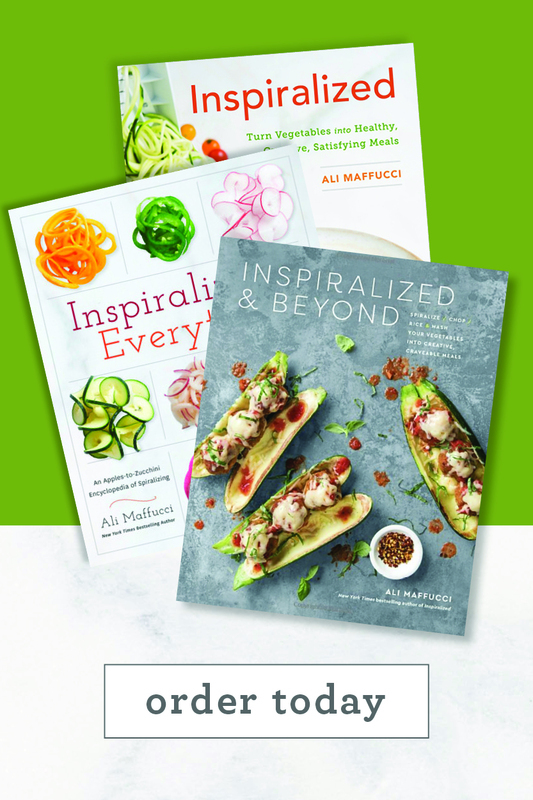 Thanks for your continued 'inspiralization' Ali! Exactly! Thanks for the kind comment, Gwen! As you mentioned in the blog my go-to mussel dish always included a white wine-butter sauce & i'd cook them up outside on the grill. Then not only would we eat the mussels but slurp up the yummy sauce.. Not to mention slurp up a boat load of calories i am sure! This is definitely a different version i am going to try. Much healthier & looks just as yummy! 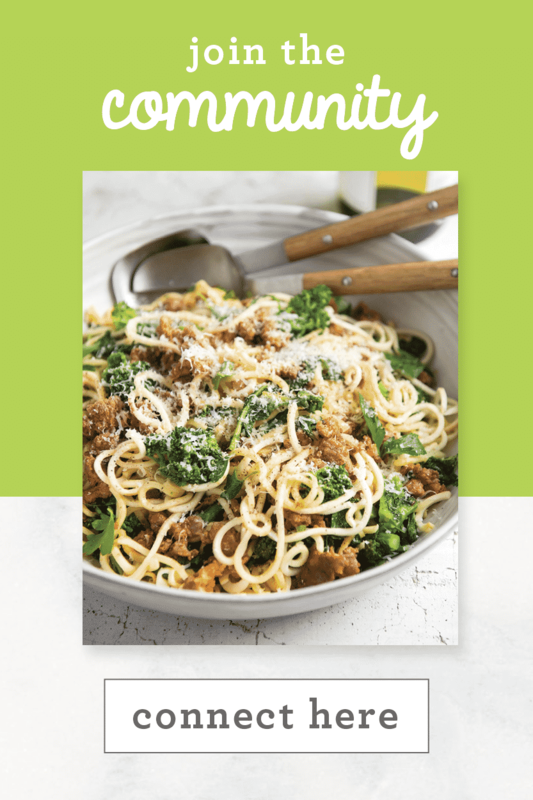 I hope you do try it this way - so flavorful and filling! Thanks so much, Frank! I'm so glad you liked the recipe! I am so happy that you liked it!! 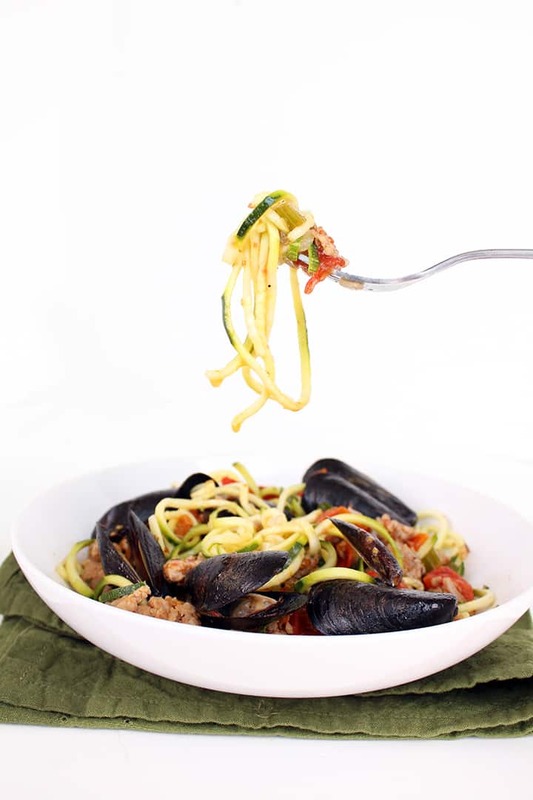 Looking forward to making this, but I'm curious… Do you really not cook the zucchini noodles before you serve it with the prepared sauce? All of your other recipes (that I've tried) with zucchini noodles instructs to soften them first. Thanks for your help!